The Purchasing Managers surveys in May showed a sharp slow down in service sector activity, with the index reaching 54.3, its lowest level since January 2017. The manufacturing sector failed to compensate for this in the composite index. These figures were confirmed by the main business confidence indicators which showed a stabilisation in retail, building and manufacturing activity (which is still supported by strong order books), but a strong drop in the service sector. Weak activity in this sector recently led to a strong reappraisal of the general outlook, which has not been lower in a year, impacting the expected prices and demand components of the survey. Part of the drop can be explained by repeated strikes in the rail and air transport sectors, which also affected tourism activity in the last weeks of the Easter holidays and early May’s long weekends. However, outside the service sector, data was not as dismal as it looked. In retail for example, despite being hit by a darker general outlook and accumulating inventories, the sector remains optimistic on future sales, and ordering intentions remain elevated. In the building sector, although recent activity has been lower than expected, expected activity remained higher than in the first quarter and capacity utilisation was still above 89%, implying still-strong hiring intentions. On that front, it should be noted that hiring intentions in the service sector, while less upbeat in May than in March, remained well above their level of 2017. 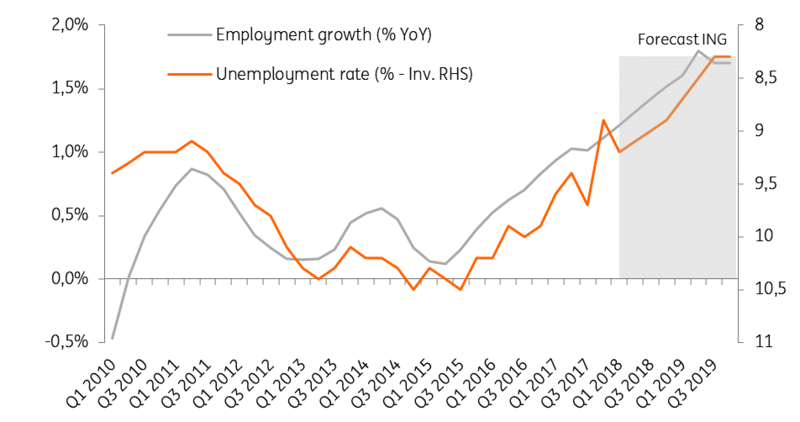 Although weaker business confidence figures are not a good sign for the job market, hiring intentions components still point to an ongoing recovery, something that was not reflected in 1Q18 unemployment figures. Unemployment in metropolitan France suffered a temporary increase in the first quarter that was bigger than expected, from 8.9% to 9.2%. The increase in the unemployed population would have been 80,000 following the ILO measure, while Pole Emploi measured a 52,000 rise in the first quarter. The only way to reconcile both measures is to take the total unemployment decline in the nine months to March (around -40,000). Both measures then show that the trend is positive and that unemployment is on a downward trend, although it is not a quick one. The figures are currently distorted by the end of past subsidised contract measures. For example, in the last nine months, we saw a decline of 100,000 in unemployed categories D and E (which count unemployed people not looking for a job as they are on training, apprenticeship or some form of subsidised jobs): they were mostly absorbed by new job creation, leading to a net decline in the unemployed population to 3422k (-2.2% YoY). In 2018, 120k subsidised jobs should disappear, which means that weak readings in the unemployed population data do not necessarily reflect labour market weaknesses. We therefore continue to believe that improvements will be felt by French consumers this year, leading to somewhat higher private consumption growth in 2018 and decisively higher in 2019. Nevertheless, the improvement in employment growth looks too slow, at just 1% in 2017 after 0.7% in 2016. Moreover, unemployment among the youth remains very elevated at 22% (against 25% at its peak in 2016), which fuelled the debate this week around new measures for France’s 1200 suburban areas (home to 5.5 million people) where youth unemployment was 45% at the end of 2017. There is no doubt that more reforms are needed on that front to accelerate employment growth. The second part of the labour market reform aims to invest heavily in the transition from training to jobs for the youngest. It should be debated before being adopted next September.